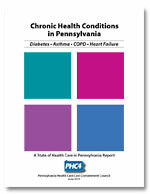 This new PHC4 report on chronic diseases serves as a periodic update on the state of health care in Pennsylvania. It focuses on four common and costly chronic conditions – diabetes, asthma, chronic obstructive pulmonary disease (COPD), and heart failure – and covers the period from 2004 to 2008. The report includes in-depth information on hospitalizations for these four conditions, including data on hospitalization rates, readmissions and Medicare payments. The purpose of this report is to provide information about the burden of these illnesses and insights as to where prevention efforts can be directed.